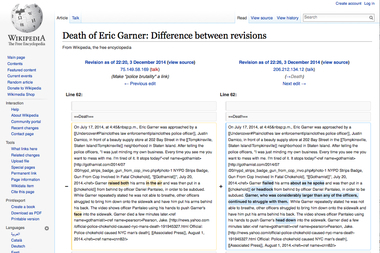 Users on the NYPD headquarter network made several changes on the Death of Eric Garner Wikipedia page, Capital New York reported. MANHATTAN — Computers located inside the NYPD's Lower Manhattan headquarters were used to edit Wikipedia entries on alleged police brutality cases, Capital New York reported on Friday. Pages for the "Death of Eric Garner", "Stop-and-Frisk", "Sean Bell" and "Amadou Diallo" were edited several times in recent years by computers located at 1 Police Plaza, according to the site. The Eric Garner entry was reportedly edited on Dec. 3, 2014, shortly after a Staten Island grand jury decided not to indict NYPD officer Daniel Pantaleo for his death. “Garner raised both his arms in the air” was replaced by “Garner flailed his arms about as he spoke,” while the sentence “Garner, who was considerably larger than any of the officers, continued to struggle with them,” was added to the entry, the site reported. Two edits were also made to the word “chokehold,” which was replaced by “respiratory distress” and "chokehold headlock" in separate mentions. The revelation came when IP addresses — which locate computers when they connect to the internet — used for the edits were traced to the NYPD network, Capital reported. Some of these changes were later removed by other Wikipedia users. Several edits coming from computers located at 1 Police Plaza were also made to the “Stop-and-frisk” entry between 2012 and 2013, the site said. For instance, “The stop-and-frisk program of New York City is a practice of the New York City Police Department to stop, question, and search people” was replaced by “The stop-and-frisk program of New York City is a practice of the New York City Police Department to stop, question and, if the circumstances of the stop warrant it, conduct a frisk of the person stopped,” Capital reported. Other edits made by users via NYPD headquarters' computers included deleting the entire section of “Allegations of police misconduct and the Civilian Complaint Review Board (CCRB)” and the “Other incidents” sections from the NYPD Wikipedia page, the site said. Edits were also reportedly made on the entries for Sean Bell and the Amadou Diallo entries, both unarmed men who died after being shot by police officers. On the Diallo page, someone using a computer inside 1 Police Plaza changed “unarmed” to “armed” when describing the incident, Capital reported. It is unclear how many users were involved in the edits, but at least 85 IP addresses located at 1 Police Plaza were identified by Capital New York. Wikipedia keeps tracks of changes made to entries, and if edits are made anonymously, the website keeps a public record of the user's IP address. A NYPD spokeswoman said the matter was under internal review. Computers throughout the department have access to the Internet and user history can be tracked back one year, police officials said. Investigators believe that the computer used to make the edits was located outside of 1 Police Plaza and they are zeroing in on the person, sources said. Edits that were made prior to Police Commissioner Bratton's tenure will not be traceable, officials said. None of the changes were authorized by the commissioner and the person who made the edits could face departmental penalties for unauthorized use of police equipment.